Open the installer package and follow the instructions. You may install GtkRadiant anywhere you choose. Run GtkRadiant from the shortcut provided and choose a game to edit from the game-selection dialog. Set the path to the engine in Edit > Preferences > Settings > Paths. Upgrade to the latest drivers for your opengl graphics hardware. Enable far-clip-plane in Edit > Preferences > Settings > Camera. This reduces the number of game components in view, by shortening the distance that the editor can "see." Use Ctrl+']' to set the distance to 13 (a good number in this case). If you have a very old system, reduce the Texture Render Mode in Edit > Preferences > Display > Textures. Select an option earlier on the list than your current setting. We recommend not going below Nearest MipMap first. This reduces the amount of blending and filtering in the textures as they are seen in the Camera window, but still lets you see what the textures look like in a relatively undistorted manner. The Nearest setting will further improve performance, but textures may be distorted when seen in perspective. In Edit > Preferences > Settings > Orthographic, disable “Update views on camera move.” This will stop the 2D-map window(s) from being redrawn when the camera position changes. Reduce the Texture Quality in Edit > Preferences > Display > Textures. Increase the Patch Subdivide Threshold in Edit > Preferences > Display > Patches. Further performance can be gained by filtering curves with View > Filter > Patches. To set up your editing preferences, open the Edit menu and select Preferences. Use preferences to set a variety of options and editor behavior based on your personal preferences. Log The Console To radiant.log - This will cause GtkRadiant to create a log file of all output from the GtkRadiant console. This can cause the editor to slow down, and is normally used for debugging purposes. Choose a game configuration to use from the list. GtkRadiant must be restarted before the configuration will take effect. GtkRadiant now stores preferences on a per game basis. Any settings for a given game are stored for that game mode only. Start on Primary Monitor - Work-around for opengl problems with certain multi-monitor opengl implementations. Disable System Menu on popup windows - Work-around for window-manager problems on multi-monitor systems. Native File-Chooser - Use the standard windows file-chooser instead of the GTK+ file-chooser. Default Text-Editor - Use the program associated with *.txt file-type when editing text-files, instead of the built-in text-editor. Layout - Choose from four layout styles. Split Window View - This is the QeRadiant default view. The Camera, XY Map, Z-axis Scale, Texture, and Console windows are constantly displayed. While the arrangement of the windows cannot be changed, their size is adjustable by pulling the window border splitters. The Entity and Group windows share a common pop-up window. This arrangement is one that may work particularly well for mappers using smaller monitors and slower computers. Floating Window View - This is the view used by id designers. The position, arrangement, and size of the windows are all adjustable. The windows initially come up on top of one another (a known bug), but once positioned, this view offers the greatest flexibility. The Camera, XY Map, Z-axis Scale, and a shared Entity/Texture/Console/Group window are all displayed simultaneously. Changing the size of one window does not automatically affect the others (it can lay atop the others). Additional map layout views can be cycled from menu commands or bound keys. This view only works well if you have a 20+-inch monitor. Make it Big! In floating windows mode (ONLY), you can double-click on any window’s Title Bar to enlarge the contents of the window to fill the screen. Double clicking on it again reduces it back to normal size. Quad View - The display window is split into four equal-sized windows: Camera, XY Map, YZ Map, and XZ Map. This is similar to other editors and offers four-way viewing. You see the map components in three views simultaneously. The size of the windows (relative to each other) can be adjusted, by pulling the splitters. The combined Entity/Texture/Console/Group window is brought into view as a single, floating window that lays over the others. The Z-axis window is not used in this view. This is a popular editing configuration, but it has significant performance issues. The editor is drawing all the 2D map components three times (plus maintaining a camera view). Some mappers have notice significant performance slow-downs when working with curves. Using the Quad view is only recommended for mappers with more powerful computers. Reverse Split Window View - Essentially the same as the Split Window view, except that the layout is flipped left to right. Detachable Menus - allow the menus to be detached and moved around. Patch Toolbar - Show additional patch-specific toolbar buttons. Patch Toolbar - Show plugin-specific toolbar. Mouse Type: 2 Button / 3 Button - Use 2 button mode or 3 button mode. Each mode is different in some ways. The hot keys and key combinations are generally different for each mode. Right Button Activates Context Menu - If checked, this will create a menu where ever you click in the 2D View with a list of the entities you can select and place. Texture Quality - This will increase or decrease the texture quality displayed in the texture window and 3D View. Texture Gamma - Lower gamma values will brighten the textures. It is recommended to use the OS display settings to adjust gamma for your graphics card instead. Texture Render Mode - Changes the filtering quality when rendering textured polygons in the OpenGL views. Hardware Texture Compression - Choose the texture-compression system to use, reduces texture memory usage. Patch Subdivide Threshold - Set the minimum curvature value at which to stop subdividing a patch for rendering. If set to low it can slow down the editor. If set very high it will look blocky. 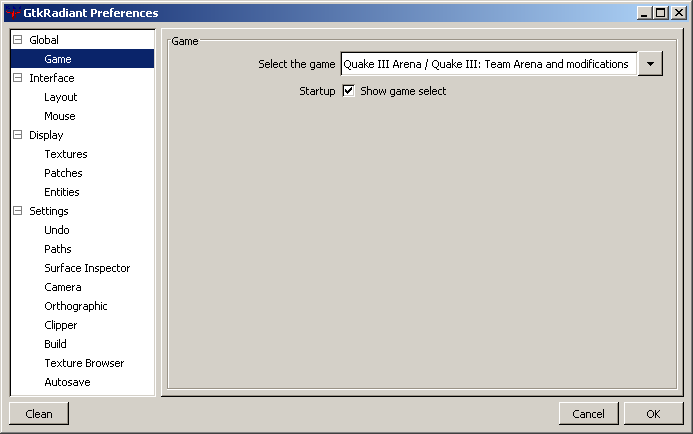 Essentially it works like the Quake3 r_subdivisions option. Show Light Radii - Enables rendering of light-radii around light entities. Undo Queue Size - Set how many undos you can do. This does require memory so do not set it too high if you do not have alot of memory. Engine Path - Set the path to the engine for the game being edited. Surface Inspector Increments Match Grid - Automatically fill in the Surface Inspector's shift 'step' values from the current grid setting. Movement Speed - This will increase or decrease the movement of forward, back, and strafing speed in the 3d view. Rotation Speed - This will increase or decrease the turning speed in the 3D View. Invert Mouse Vertical Axis - This will reverse the mouse controls in freelook mode. Discrete Movement - If checked, this causes the view in the 3d view to move one step at a time. If unchecked the movement is smoother. Enable Far-Clip Plane - sets the far-clip plane to be close to the camera. Improves rendering speed by reducing the amount of objects to be drawn. Render Mode - Choose the camera rendering mode from Textured, Flatshade or Wireframe. Solid Selection Boxes - This will make anything selected draw with solid lines rather then the old style of dashed boxes. This can speed up rendering on Nvidia TNT cards. Display Size Info - If this is checked on, it will display the size information of any object selected. Chase Mouse During Drags - Turning this on causes the view to chase the mouse if you drag something off the edge. Update Views On Camera Move - When interacting with the camera (which you will do a lot), turning this off will NOT update the camera icon location in the Map windows automatically. This can help with speed but prevents you from seeing exactly where the camera icon is positioned. Clipper Tool Uses Caulk - When using the clipper tool, the faces that are created from the clip will add a caulk texture to the brush. Enable Build Process Monitoring - Enable this to send output from q3map2 back to GtkRadiant for analysis. Stop Compilation On Leak - This will cause the bsp compile process to halt when a leak is found in a map during the BSP process. Run Engine After Compile - This will cause the game to launch after the compile process is complete. Activate Sleep Mode When Running The Engine - This is automatic now. GtkRadiant will go into sleep mode when you load the engine after a compile. Warning. With some video drivers, it is a bad idea to run Quake 2 or Quake III Arena and the GtkRadiant editor. The drivers just will not sustain two demanding OpenGL applications simultaneously. This feature is best left turned off. Texture Subsets - This provides a texture edit window within the texture window. It is still buggy as of build 188. It puts a text field at the top of the Texture window. Type in the first few letters of a texture name and the window will only display the textures beginning with that letter or letters. Texture Scrollbar - If checked, this will add a scroll bar to the texture window. Tex Increment Matches Grid - If checked, this will cause Radiant to use the grid spacing when moving and aligning textures with the shift + arrow keys. Default Scale - The default scaling of textures on load up of the editor. Startup Shaders - You can choose to have certain shaders load upong startup of the editor or to not have any load on startup. Wheel Mouse Inc - This number will adjust the amount the texture window scrolls in the texture window when using the mouse wheel. The higher the number, the faster it scroll basically. Snapshots - If checked, this will create snapshots every 5 minutes of your level. They are saved into your maps directory and have a numbered order (eg. .001 .002) for the file extension. Load Last Project On Open - If checked, GtkRadiant will automatically load the project settings you last used. Load Last Map On Open - If checked, GtkRadiant will load the last map you had open during your last session. Auto-Save Every - Here you can choose to use auto saving, and how many minutes between each auto-save. The project settings dialog allows you to configure GtkRadiant for mod editing. You can choose a mod 'game-name' from the list, or enter a custom game-name. Depending on the game being edited, you can also choose between single-player and multi-player game modes. You can customize the build-menu with Build > Customize. Click on an item in the Build Menu list to edit its name. Select an item and press 'Delete' to remove it. Select an item and edit the Commandline list to customize its commandline. There are six configurable windows in GtkRadiant. The Camera window initially shows a gray field. This is where the 3D in-progress view of your map appears. You can SHIFT + click mouse button 1 to select objects in this window. If the images in this window appear overly dark, you can adjust the gamma value. Open the Misc menu and select Gamma. Enter a value between 0 and 1 for the light value. Close the program. Reopen the program. Check the darkness. Repeat this until you have a value you like. Depending on the Windows layout view that you’ve chosen, one or more of the following sub-windows share this window. They are selectable by the tab at the bottom of the window, or by shortcut keys. The Entity window is one of four windows that share the same window space: Console, Entity and Texture and Group. The entity window is used to create and modify the properties of game entities. The uppermost box in this window contains the entity names. Use the scroll bar to find the one you want or for speed, type in the first letter of the class of entity you desire (“w” for weapon, “I” for item and so on). Refer to the Working with Entities section for more details on this. The Texture window displays textures that have been loaded from the texture directories for easy use. The texture subset tool (set in preferences) allows you to quickly jump to a texture if you know the first few letters of its name. The scrollbar tool adds normal Windows functionality to the window. The most common method of navigating the window is to right-mouse click and drag through the window contents. SHIFT + right-mouse click and drag speeds up the rate of movement through the window’s contents. A thin green outline around a texture indicates a non-shadered texture in use in the map. A thin white outline indicates a shadered texture. A bold red outline indicates a selected texture. The console tracks the editor’s processes, like loading, saving, and compiling. When you compile (selecting an option from the bsp menu), the contents of the console are dumped into the junk.txt file in your Temp file folder on your root drive. In the Split Window view layout, the Console window is always in view. Think of the Orthographic window as a piece of graph paper, neatly divided into squares. However, unlike graph paper, you can change the size of the grid to fit your needs of the moment. You can change grid size from the Grid menu, but it’s faster to learn the key shortcuts listed below. There are four distinct ways of laying out the work windows for GtkRadiant. Try not to build architecture with a grid smaller than 8 units. Use a smaller grid if you need to build small details. Use a large grid (32 or 64) for roughing in a level. Use a large grid for moving large chunks of architecture around. GtkRadiant allows you to select the colors of your grids and tools. Because the manual refers to the colors of some features, you may wish to wait until you are more comfortable using the editor before changing too many things. You can always revert to the GtkRadiant defaults, should you choose change too much. To change Map window and Texture window colors, select the “Misc” menu and choose colors. The pop-up lists a number of options. GtkRadiant Original: The default setting. Black & Green: a black background with a green grid major. Maya/Max/Lightwave Emulation: a grey background with a light-grey grid major. Each of the following options opens the Windows color selector. The background color for the map window. The background color behind the textures in the texture window. This is probably best left a neutral color. These bolder grid lines mark 64 unit increments in the map window. These never change. The finer grid lines in the map window. The color of the scale numbers along the left and top of the map window. These lines mark the 1024 x 1024 unit grids on the map. This is the color of unselected brushes in the map. The color of selected brushes in the map. This is the text that says “XY Top” or “YZ Side” or “XZ Front” in the map view window(s).